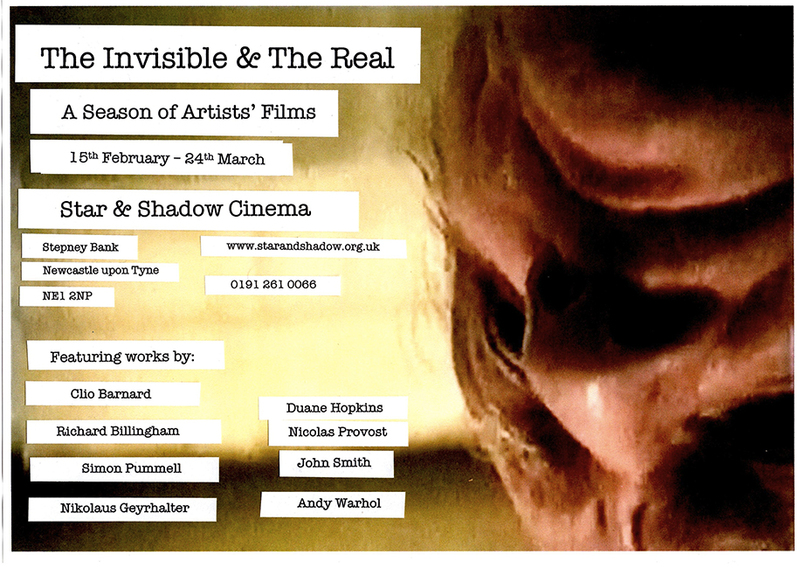 The Invisible And The Real is a season of artists’ film screenings at the Star & Shadow Cinema throughout February and March and features work by internationally renowned artists and filmmakers including Andy Warhol, Richard Billingham, Clio Barnard, Nicolas Provost and John Smith. This series of six events includes feature length and short films that are linked by their use of documentary techniques (real stories, interviews, archive footage, etc.) in order to create uniquely personal, political and philosophical visions of the world. 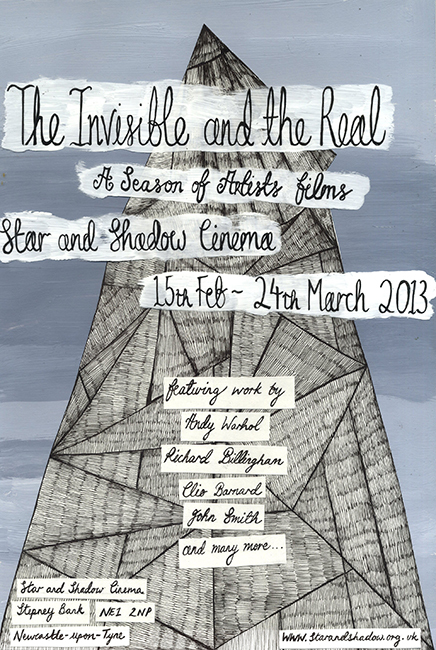 Whilst the main aim of The Invisible And The Real is to introduce audiences to some extraordinary and surprising films, it is also a chance for a deeper exploration of the documentary form. Instead of recycling stale old debates surrounding authenticity in documentary, namely what elements are real and what is a fictional construction, this season of films allows an audience to willingly accept that these works featuring real people and real stories have been filtered through, and are even at the mercy of, the imagination of the artist/filmmaker. The ‘invisible’ of the title refers to the mysterious, unseen layer of meaning that is the artist’s own creative vision. The season is such an embarrassment of riches (I’m biased, I curated it) that it seems almost impolite to single films out for particular attention, however, for the purposes of this article I will say that I’m extremely excited about the rare screening of twelve of Andy Warhol’s remarkable Screen Tests (with live musical score – Friday 15th Feb, 7.30pm) and the selection of Belgian artist/filmmaker Nicolas Provost’s short films (Thursday 7th March, 7.30pm). On loan from Museum of Modern Art in New York, Andy Warhol’s Screen Tests are a fascinating collection of moving image portraits featuring 1960s pop culture icons such as Bob Dylan, Lou Reed, Jonas Mekas and Edie Sedgwick. To create these elegiac and beautiful films Warhol would set up a static 16mm camera and expose an entire 100ft roll of filmstock in one unbroken take (lasting approximately three minutes). The icy, sustained gaze of the camera holding its subject in close-up means that minute gestures are amplified and carry real dramatic weight. The specially commissioned live musical score at the Star & Shadow will only accentuate this tension in the films: creating an intimate, evocative and personal mood far removed from the 60s kitsch that is routinely associated with Warhol. Reality takes on the mutable qualities of a daydream in the work of Nicolas Provost. In his 2007 short film, Plot Point, Provost shoots everyday observational footage (with a hidden camera) and then uses storytelling devices from mainstream Hollywood cinema to create a fictional film. Through Provost’s camera lens an average day in Times Square becomes the setting for a brooding, intense police thriller. Provost also uses found footage from classic cinema: his 15-minute masterpiece Long Live The New Flesh comprises sequences familiar to us from horror classics The Shining, Videodrome, The Thing, The Exorcist and The Texas Chainsaw Massacre (amongst many others), and then by use of a startling digital technique where the images appear to smash and bleed into one another these films are made fresh and uncanny all over again. A visual and auditory assault on the viewer, Long Live The New Flesh is one of the most disturbingly brilliant films I’ve ever seen and I can’t wait to subject Star & Shadow audiences to its horrifying wonders. Other films in the season include Simon Pummell’s multi-award winning Bodysong (Thursday 28th February – pictured above), with a stunning original soundtrack courtesy of Radiohead’s Jonny Greenwood; Clio Barnard’s BAFTA-nominated The Arbor (Thursday 21st March); Nikolaus Geyrhalter’s endlessly provocative Our Daily Bread (Thursday 14th March); and Richard Billingham’s seldom seen Fishtank (Thursday 21st February) – not to be confused with the 2009 Andrea Arnold drama of the same name. Also screening are short works by Duane Hopkins (Sunday on Thursday 21st February) and John Smith (the 1976 classic The Girl Chewing Gum on Thursday 21st March). This article was originally written for issue 81 of Narc magazine (Feb 2013).